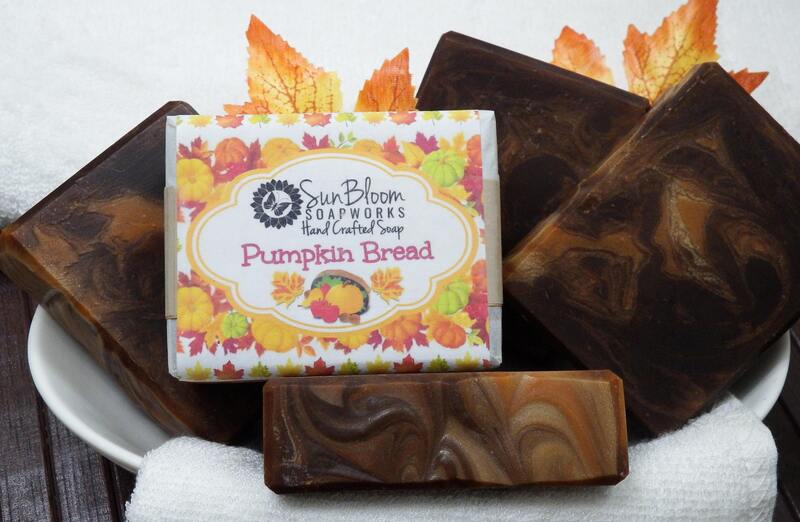 "Pumpkin Bread" Soap is nutty and sweet with front notes of walnut, pecan and espresso, middle notes of sweet pumpkin and caramel. Back notes of ginger, cinnamon and spice round out this delicious soap. One of my favorite stores to purchase soap from! The soap are all individually wrapped and they are of of high quality---they all smell amazing! I purchased a bigger than usual order since I will be giving these as gifts. I know my son's teachers will love these! The seller was also kind enough to throw in some gift bags (which she sells on her Etsy website)....and they are so beautiful! I do recommend this store because of the quality of the soap. The seller is also accommodating with her customers. Super fast shipping, friendly seller, I have been using the soap samples so far and everything smells amazing, is adorably packaged and they lather wonderful. Extremely happy with my purchase from this shop! Soaps have lasting yummy scents. Great customer service.